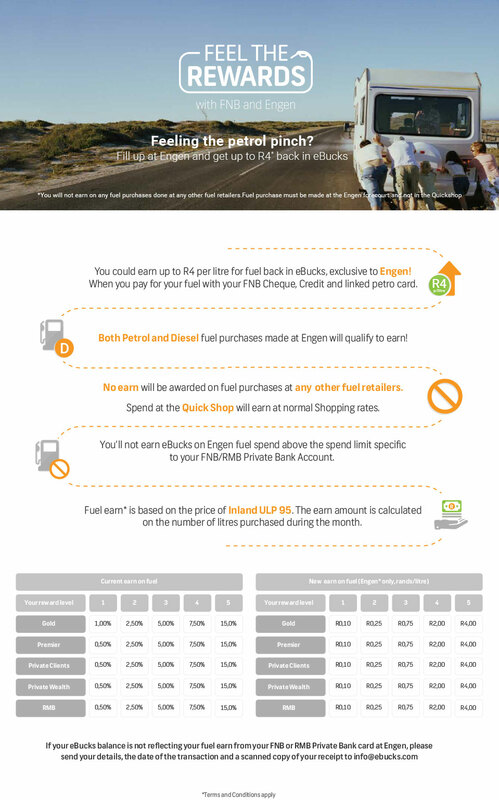 Engen has partnered with FNB to offer FNB customers the option of using their eBucks to pay for fuel at participating Engen service stations. The first of its kind, the eBucks/Engen deal is another way that Engen brings innovation to make payment for your fuel. The Price of fuel is out of our ( Garage operators and suppliers ) hands but we are doing what we can. You are likely spending money in places that reward you with ebucks already and those rewards can be used to pay for fuel at Engen. The wide range of eBucks partners ( online and retails stores ) covers everything from gadgets, electronics, CDs and DVDs, to travel, outdoor equipment, fashion and accessories, and daily household shopping. This means everyone can easily earn eBucks when buying what they want and need. You can use ebucks for everything from groceries to holidays.